Ain't Ben Grubb'in: Ben Grubbs defended Ines Sainz honor Monday night, mauling defenders in a 10-9 win over the Jets (he even autographed this picture of the heroics for her). Opening weekend and we see some Super Bowl contenders going down early: the Vikings lost an ugly game to the Super Bowl champs on Thursday, the Colts and Falcons both went down on the road Sunday, the 49ers got throttled by an average-at-best Seattle team, the Cowboys got beat by a poor Redskins team, and the Jets lost on Monday night to the Ravens. So half of the top 10 teams Vegas was picking to win the Super Bowl lost on opening weekend. Jason Campbell #8 – Didn’t enjoy his Oakland debut; the Raiders fell hard to the Titans 38-13. He had a ball batted into the air and took a hard shot from DT Jason Jones on the first play of the game. It was downhill from there against a strong Tennessee team. Jason finished 22/37 for 180 yards and a TD. He also lost a fumble and was sacked 4 times by the unrelenting Titan defense. Let’s hope he gets the train on the tracks this week in an easier game against the Rams in Oakland. Look, Ma! -- both knees! Ronnie Brown #23 – gad 13 carries for 65 yards and a TD as the Dolphins won an ugly road game against the Bills, 15-10. Heath Evans #44 – had 1 catch for 7 yards but was active as a blocker for the Saints in their Thursday night win over the Vikings, 14-9. Tony Richardson #49 – gad 2 catches for 9 yards as the inept Jets lost 10-9 to the Ravens. 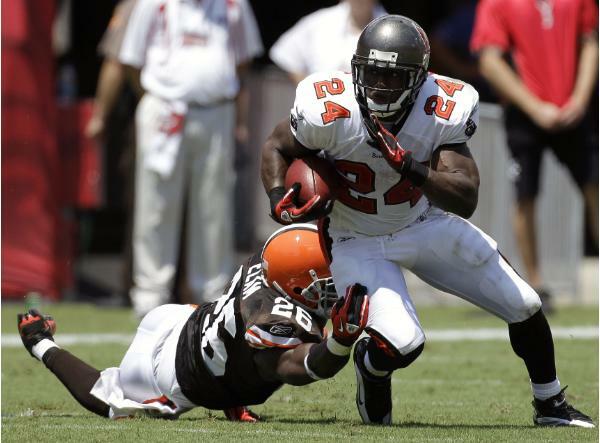 Carnell Williams #24 – The Bucs wish they could play the Browns every week: Carnell had 75 yards on 22 carries in a 17-14 win. Brandon Jacobs #27 – Comment heard Sunday: “the Giants still can’t figure out how to run the ball downhill despite having a 260 lb tailback.” Brandon had 44 yards on 12 carries in the Giants’ 31-18 win over the Panthers. Devin Aromashadu #19 – Had a nice 5 catches for 71 yards in the Bears’ 19-14 win over the Lions. Ben Obamanu #87 – Had one catch for 6 yards as the Seahawks stomped the 49ers, 31-6. Montez Billings #89 — is currently on the Saints practice squad. Prechae Rodriguez #85 — was traded and is currently playing with the Saskatchewan Roughriders. He has 30 catches for 376 yards and 2 TDs in 12 games this season. Ben Grubbs #66 – Ines Sainz said Grubbs was a perfect gentleman during his fun Monday night of mauling Jets defenders as the Ravens ground out a 10-9 win in New York. Marcus McNeill #73 – is holding out for a better contract with the Chargers who do NOT plan to trade their Left Tackle. King Dunlap #65 – played, but did not start in the Eagles’ 27-20 loss to the Packers. Tyronne Green #69 – played, but did not start in the Chargers’ disappointing 21-14 loss to the Chiefs on Monday night. Tim Duckworth #78 – was cut by the Saints and then picked up by the Panthers, he played but did not start in their 31-18 loss to the Giants. Jay Ratliff #90 – only recorded one tackle in the Cowboys loss to the Redskins, 13-7. But he’s a nose tackle, these things happen. Quentin Groves #52 – started in the Raiders 38-13 loss to the Titans Sunday recording a solid 6 tackles from his linebacking/defensive end spot. Spencer Johnson #91 – did not start, but recorded 3 tackles and deflected a pass in Buffalo’s 15-10 loss to the Dolphins. Pat Sims #90 – apparently still has a forearm injury and did not make the trip to New England on Sunday. Sen’Derrick Marks #94 – recorded 2 tackles in a reserve role for the Titans in their 38-13 win over the Raiders. 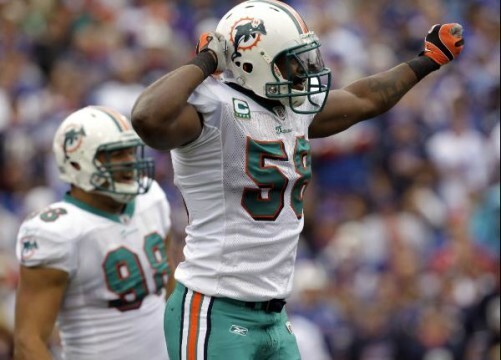 Antonio Coleman #59 – made the roster with the Bills, but did not play in the opening day loss to the Dolphins. Karlos Dansby #58 – had 8 tackles in his first start with the Dolphins. Miami went up to Buffalo and came home with a 15-10 win. Will Herring #54 – had one tackle from his reserve role with the Seahawks in their convincing 31-6 win over the 49ers. Takeo Spikes #51 – started and had 5 tackles in the 49ers 31-6 loss to the Seahawks on Sunday. Reggie Torbor #53 – did not play in the Bills’ 15-10 loss to the Dolphins. Carlos Rogers #22 – Carlos started for the Redskins and had 6 tackles, mostly coming in run support. Carlos had a good night and had very few passes completed to his side, but Skins fans are still complaining about a dropped interception in the 4th quarter. Skins still pulled out the victory, 13-7, over the Cowboys. Jonathan Wilhite #24 – got the start and 6 tackles in the Patriots 38-24 win over the Bengals. Jerraud Powers #25 – recorded 7 tackles in his start for the Colts in a 34-24 loss in Houston to the Texans. Pat Lee #22 – played mainly on special teams Sunday in the Packers’ 27-20 win over the Eagles. He did not record a stat. Robert Bironas #2 – was 5/5 on extra points and hit a 43 yd field goal as the Titans beat the Raiders in Nashville, 38-13. Damon Duval #15 — is still kicking with the Montreal Allouettes. He is 29/29 on XPs and 23/31 on Field Goals this season. HB Tristan Davis was cut by the Dolphins after he fumbled a kick return in the preseason. He has not been picked up by any other team. You can read his former-Tigers-only break down of Madden’s revamped rating system here. LOL look ma! Both knees! Whew. The Raiders STINK! I thought about buying a TV package to watch their games, but after their game against the Titans … no freaking way! I hope that it was just a first week kinks and traveling across the country that is to blame, but that offense was amateur hour. JC just might have an even worse offensive line this year to protect him. Instead of a zillion quick short-yardage throws to Cap’n Chaos Chris Cooley, now he gets to pepper his new safety net, Darren McFadden, with quick short-yardage throws. He just doesn’t get the time to throw the ball down the field. Yes the Raiders are pretty bad, but I think we are underestimating the Titans. They do have the premier back in the league and the have always had a great defense. Plus Jeff Fisher is one of the best coaches in the league. Vince Young may not be a great QB, but give him a lead and you have almost no shot to beat them. I need another week before I say that Oakland is really that bad. Merrill Johnson appears to be hanging at the house. Robert Dunn – pursuing career in hip hop.